We arrived at the elephant camp in time to see a few of these really lovely creatures taking a Jacuzzi bath in the river. They seemed to thoroughly enjoy the rushing waters of this small river. A few of them crouched down right in the middle and laid themselves out sideways, nearly fully immersed. Vendors sold bunches of bananas and bundles of sugar cane to be fed to the elephants and that was quite fun to watch. Most of you will be quite surprised that I didn’t toss down my 25 baht for one or the other of these treats. I buy the pellets from the vending machine for the fish at Dixie Crossroads and the buckets of fish from the hut for the dolphins at Sea World and just about anything else someone sells to feed to one critter or the other. After a few photos at the entrance area and as we crossed the bridge, we headed up to the elephant show. 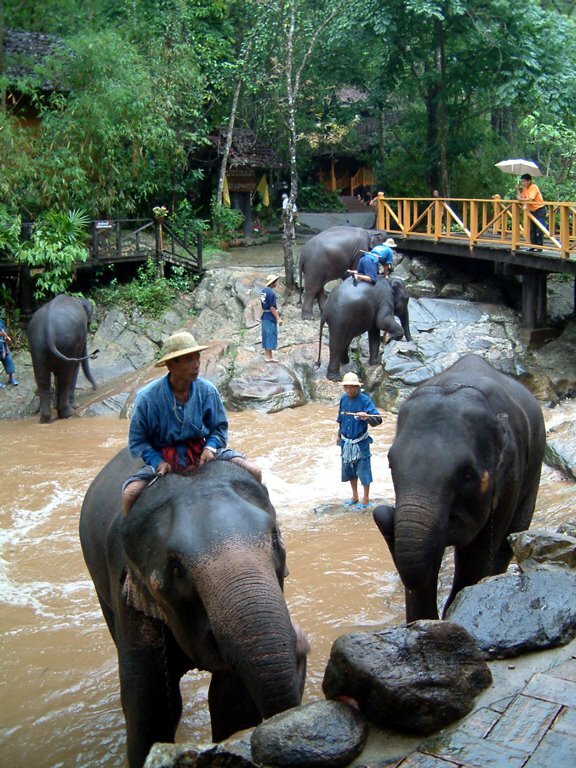 The elephants – each with his or her own trainer – paraded, played harmonica, painted, played soccer and did a few other “tricks.” Elephants have been used as work animals in Thailand – particularly in teak harvesting – for many years. I enjoyed the fact that there was not a narrator on the loud speaker telling silly jokes and outrageous stories about what we were seeing. We just saw what we saw. 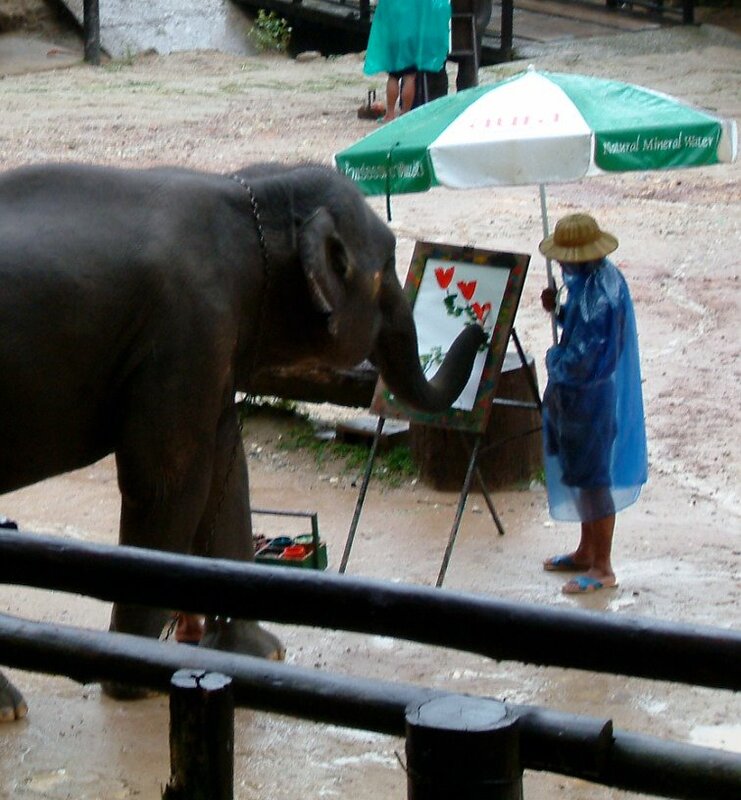 The elephants painting was the wildest thing for me to watch — knowing that this is learned behavior, but still — how do you teach an elephant to paint? From here, we moved to the main event. 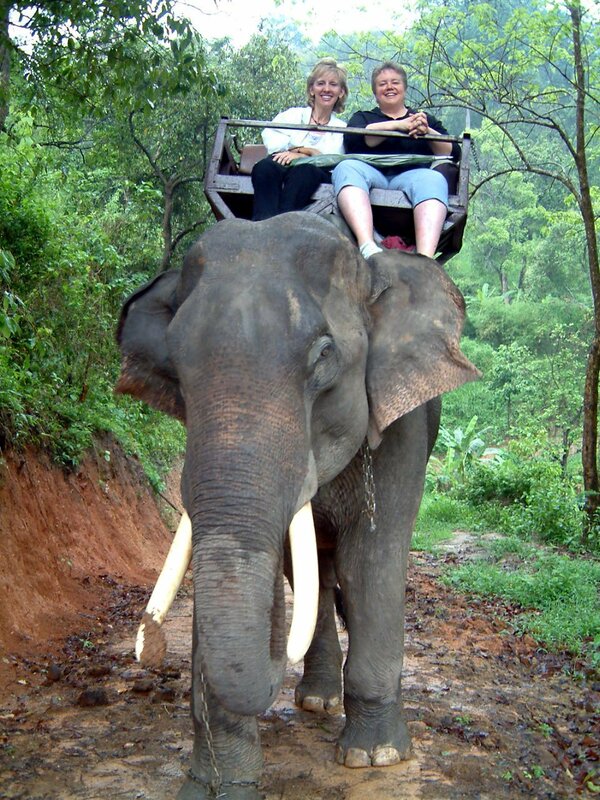 Now, most of you know that before I left the States a month ago I wanted to do the elephant ride and show if I could on this trip, but for a variety of reasons that was look looking unlikely. Then, a couple of days ago – when Tammy asked me if I might be interested in the elephant ride on Saturday and when a more careful reading of the conference agenda suggested that I could be free in the afternoon on Saturday and a stop by the SAM table proved that they were offering a ½ day trip to the elephants – it became a part of the plan once again. Woo hoo. The eleven of us from the conference who were on this adventure together climbed a flight of stairs onto a wooden platform from which we mounted our respective elephants. Tammy and I scoped out the elephants that were lined up and chose one with tusks deciding that this one would make for good photos. By this time I had found out that Tammy is not fond of heights and she was coming to grips with the reality that elephants are quite tall creatures. When you effectively mount a wooden sofa on top of one’s back…well, it’s high. We climbed onto our elephant and the assistants locked the front bar over us like a roller coaster. Our driver handed us an umbrella as it had been raining all day because of a typhoon out to the west. While I was only sad that I had shoes on and wanted to feel the elephant’s rough skin against my feet, Tammy was coming to a quick conclusion that this was not her best idea. Before she could do anything about it, we were bobbing and swaying across the compound toward the first shelter where a photographer captured our souvenir photo which we could later purchase in an elephant dung frame for 200 baht (about $7 US). As our elephant – fifth in a line of six – ambled along the muddy path strewn with elephant droppings which only proved that these critters had taken this pathway hundreds and maybe thousands of times before – I was having a delightful time and Tammy was calculating the risk of injury if she determined to jump from this elephant sofa onto what was soft earth below. She was planning her escape. By this time, riders on each elephant were snapping photos of one another with promises to swap them later thanks to thumb drives and email. 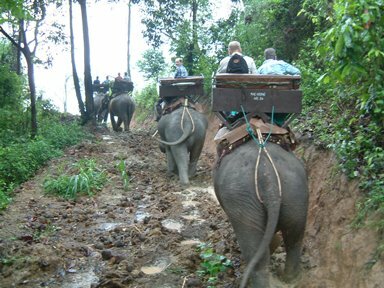 About half way up this train, riders began hopping off their elephants with OUR digital cameras in hand and taking photos of us. Our driver would run ahead, aim and shoot just seconds before our elephant caught up. Our elephant was not cooperatively pausing to pose as others were – heads tilted and legs crossed. Our elephant was on the move. An elephant with a mission: GET THIS OVER WITH. If Tammy looks relaxed in these photos (and she does) it’s greatly due to the fact that we were so amused at how hard our driver had to work to get away from our speeding elephant. We were at the “top” of this first hill by the time he climbed back on board and started “driving” again. Downhill felt more precarious on this flat and slippery wooden sofa on top of a tusked elephant in the rain. It had some of the same sensation as doing down a steep incline on horseback – but we were far enough removed from the creature itself that we didn’t have anything in front of us exactly. When we reached a fork in the road, three of the elephants in front of us and one behind went down and our elephant followed the one in front of us to higher heights. A seventh elephant with two guys we didn’t know was coming up behind and followed us. Our elephant seemed to decide that the faster it went, the sooner it could back to the feeding trough but the elephant in front of us did not have this same idea. Along a stretch of the path that wasn’t quite wide enough to pass, it began to tail gate the elephant ahead – nearly pushing with its head.